The English language is more than 1,000 years old, but new words are being added to the language all the time. 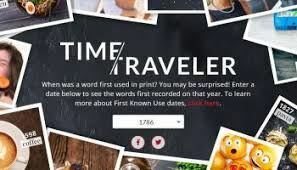 The website for Merriam Webster Dictionary has a new feature called Time Traveler, where you can enter a year and find out words first used in that year. You can enter the year you were born, or the year you immigrated to the U.S. to find new words for that year. For example, words first used in 1978 include: control key, eye candy, face time, frequent flyer, sticky note, and surrogate mother. You can also look up the meaning of most words, and it will tell you the year the word was first used. For example: helicopter parent. For fun, take the Time Traveler Quiz – to see if you can guess which of two words was used first. This entry was posted in Intermediate, Vocabulary, Websites. Bookmark the permalink.